President Petro Poroshenko instructed Foreign Ministry to file a lawsuit against Russia to the international arbitration regarding the protection of rights and interests of Ukraine guaranteed by the UN Convention on the Law of the Sea of 10 December 1982 violated as a result of the armed aggression of Russia, the presidential website reported on 14 September. The lawsuit is filed due to the gross violation of the international law by Russia, aggression against Ukraine, annexation of Crimea, violation of Ukraine’s right to natural resources in the Black and Azov Seas. The head of state added that the lawsuit was also caused by the robbery of Ukraine in the field of energy, when Russia steals oil and gas from the shelf of Ukraine. It is a theft of marine resources and pollution of our territories with negative impact on the ecology of the Black Sea, including during the construction of the Kerch bridge, the statement reads. “I instruct the Foreign Minister of Ukraine to sign and submit notification about the arbitration under the UN Convention on the Law of the Sea to Russia today,” the President said. He also noted that the legal position of Ukraine was firmly based on clear evidence and Ukraine would prove by means of arbitration legal facts of Russia stealing natural resources and damaging maritime ecology. 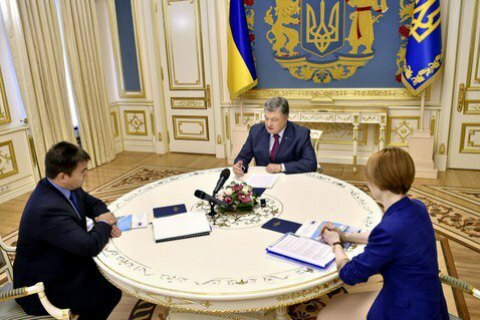 Poroshenko emphasized that the international arbitration enjoys global recognition and is designed to resolve such disputes. He is hopeful that Russia will take part in the process as signatory to the UN Convention on the Law of the Sea and “will not hide from international court organizations like in the situation with the establishment of the international arbitration on the investigation into the MH-17 tragedy”. “The truth and solid reasoning is on the side of Ukraine,” the President said and expressed confidence that the launch of that process would facilitate the restoration of full control over the maritime area of Ukraine and reimbursement of damage suffered by Ukraine as a result of the Russian armed aggression. “I think it is the first, but very important step,” the Head of State noted adding that he would keep the given situation under his control. “We are ready to fight for the protection of our legal interests and rights,” the President emphasized and noted that it was only one of many steps in that direction. Pursuant to his instruction, documents are being elaborated on the basis of various international documents and conventions in order to file suits to other international courts. Particularly, it concerns the protection of property rights of business entities of Ukraine affected by the annexation of Crimea and rights of state institutions annexed by Russia in Crimea. The head of state noted that the State Budget for 2017 would increase funding of the Foreign Ministry and provide for the implementation of such functions.